Steven tells Lapis about his ordeal and she responds the only way she knows how. "We're gonna R-U-N-N-O-F-T!" -Lapis, probably. Synopsis: Steven waits anxiously for Connie to start talking to him again. The call finally comes in... but it's from Peridot and Lapis. They're happy he's safe but when Lapis learns what Steven did on homeworld she becomes very agitated and the call ends. Steven heads to the barn and finds Lapis ready to go despite Peridot's increasingly desperate objections. What about the crops? What about Camp Pining Hearts? WHAT ABOUT THEIR MEEPMORPS?! Lapis, in a rare display of her power, lifts the entire barn on a cushion of water and announces it's now or never. Peridot notes Pumpkin has vanished so Lapis sets the barn down and they set out to find him. Peridot and Steven scour the countryside for Pumpkin, and discuss the effects of them leaving Earth, including the loss of precious Wifi. Onion makes a brief, pointless appearance at a roadside onion stand he probably stole. Dejected, Steven and Peridot return to the barn, where of course they find Pumpkin cowering in the corn. Peridot grabs him and says explains that sometimes you have to exile yourself to space forever because that's just what your emotionally damaged friend needs! Steven, flush from his experience with the ex-mayor, reads the subtext. Lapis prepares to go again, but Peridot works up the courage to confront her. Maybe the Earth and everyone on it is doomed, but Peridot wants to face that Doom, together with her new friends! Isn't the Earth worth fighting for? Lapis, however, has zero interest in being a part of another war. She takes the barn and leaves. Steven moves Peridot back into his bathroom and checks his phone. No missed calls. What do we do now? 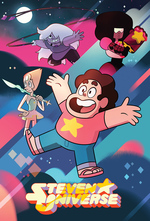 Poster Notes: Like most of the episodes in this bomb, this one also addresses Steven's decision in I Am My Mom. Unlike last episode, the moral isn't so anvilicious. Lapis's decision to leave is essentially the same one Steven made, just with a different justification. Steven gets to be on the receiving end, watching someone he loves leave because she thinks it's the only way. It's nice to see a hint of Lapis's world-shaping power again. I've decided that her gem being cracked in Ocean Gem allowed her to realize her power in a way she can't while whole. I can also appreciate her desire to stay out of conflict. She's had an incredibly traumatic life. Obviously I don't agree with her decision to leave, but i find it is consistent with her character. Also, aww, Peridot really has gone native, something I can't see Lapis really doing. I'm not convinced Lapis will ever be comfortable anywhere. Lapidot shippers: I'm sorry. Amedot shippers: congratulations. We finally get the fallout for Peridot and Lapis' becoming codependent and oof, it's bad. In the end no matter how much Peridot tried (and she did try, her personality with Lapis is nothing like with everyone else), Lapis has her own problems and needs to deal with them herself. All the Gems have been shown to be really bad at dealing with change and trauma (which makes sense since... they are rocks). Blue Diamond was a grieving mess for 5000 years! Peridot (and all the other gems in their respective arcs) were able to deal with their problems because they embraced the change. Lapis at best tolerates Earth and her current living situation, mainly because of Steven and Peridot, but she still seems to be firmly in the "nope, I'm not dealing with this" stage of rock people. I hope she does return at some point (and a lot of people think the unreleased song "Escapism" is about her dealing with her feelings about Earth but I'm not sure), mainly because Steven Universe is such an optimist show that it'd be weird for Lapis to be the only one unable to live past her trauma. Note: I watched it in this order too but this is actually episode 7, which explains why Peridot is weirdly missing in Gemcation. Lapis I love you girl but you are kinda causing harm and also scary powerful. I guess she is going to use her unexplained ability to fly to other galaxies on water wings to take the barn somewhere? Ugh. Huh! Yes it seems like Gemcation is supposed to be episode 6, which makes more sense. Gee, this would be easier if Cartoon Network just aired these episodes like a normal cable channel. I noticed when I watched them on the app the order it initially was in was completely random, I thought I had corrected it. Andy's gunna have things to say about the absence of his Fine American Barn. My heart breaks for Peri. She tried so, so hard, my poor little green weirdo. It isn't over, not by a long shot. Well, what were Peridot and Lapis going to do with all that corn? Eat it? Set up a roadside stand? Not every vegetable is going to get the chance to become sentient. Is the point here that not saying things that upset people is a bad idea? Because I've been trying for a long time to say less things that upset people. Is that what being codependent is? Were Lapis and Peridot codependent? Is being non-codependent such that someone can leave without it making you feel miserable? "You're supposed to reward me for my emotional honesty!" It's a good question. My take is that Lapis has genuine issues she needs to address, and you can't force other people to deal with your problems for you. Peridot seemed happy to bend over backwards (literally!) to keep Lapis happy, but in this case I don't think theirs was a healthy relationship. Just look at what happened when Peridot asked Lapis to do something for her in return. You can't tell me that living in fear of what your partner will think if you tell her the truth is healthy.